7 Hidden Gems of Hong Kong that locals don't want you to find out! Hong Kong is a unique blend of fascinating skyscrapers on one hand and rolling country side on the other. However, if you ask any Singaporean, they will tell you one thing- “Hong Kong is good for a weekend and then you will crave to return to Singapore”. I am not a Singaporean but I stayed there for almost 2 years and it takes less than 2 weeks to get used to the convenience and high standard of living in Singapore. Naturally, I was expecting the worst as I landed in Hong Kong and the worst is what Hong Kong gave me in the first week. However, what most people don’t tell you is that Hong Kong is much more than a bunch of skyscrapers and hills that take hours to climb. 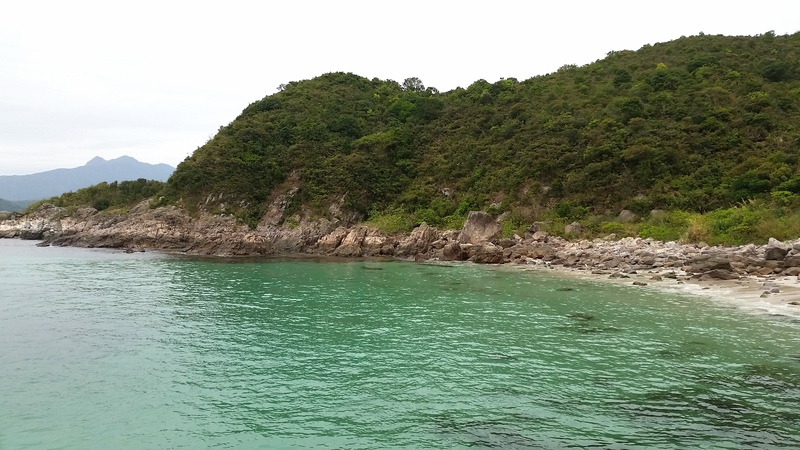 As I ventured out of the city to the outlying islands, I discovered the true beauty of Hong Kong. Since I was recovering from a leg injury, I could not really hike steep slopes but I did not let this stop me. While the Victoria peak, sailing in the Aqua Luna and a night of horse racing in Happy Valley are famous must-not-miss experiences in Hong Kong, there are a bunch of secrets that the tourist guides miss out on. Below are Hong Kong’s hidden gems which are truly worth exploring. If you are planning a trip here, it is worth checking out Treksplorer’s guide on the 15 best hotels in Hong Kong. 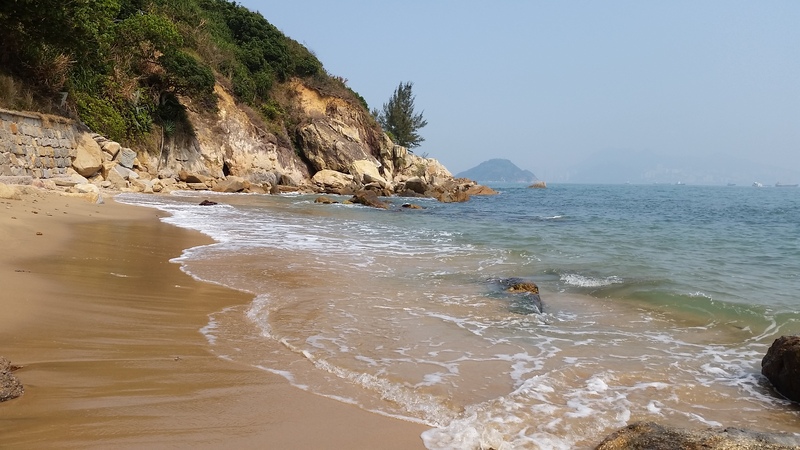 This is often referred to as Hong Kong’s underdog island and for a reason. Minimal amount of tourists, fantastic views and a lazy vibe makes this island my absolute favourite. Ferry from central pier drops you at this island where you suddenly find yourself at a whole different world- away from the hustle bustle of Hong Kong. Walk past the various group of elderly people who laze around in the sun, reading or chatting with friends and pass through the market, to reach the starting point of the family trail. You can either choose to go up the stairs or follow the trail. 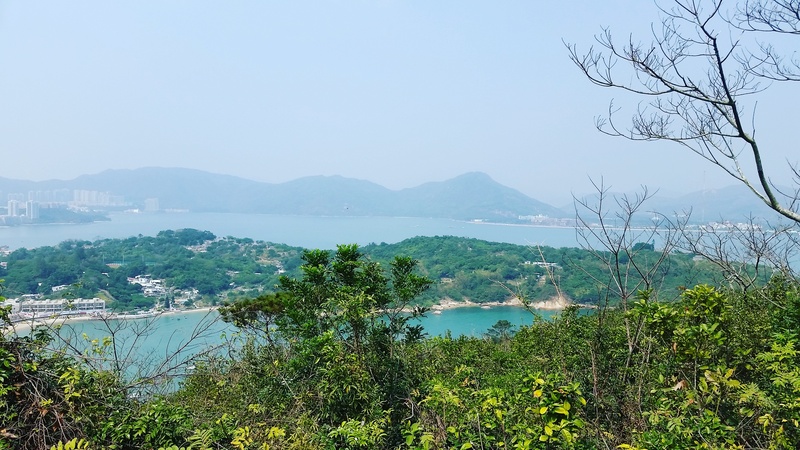 I chose to climb the stairs instead of walking the trail and was greeted with a great view of Discovery Bay and many other islands of Hong Kong. After chatting with some locals at the peak, I followed the trail downwards. A path bends on the left (away from the trail) and lands you in a marvelous look-out point. I stared at the small secret beach which was accessible only by private boats. Sitting by the cliff I gazed at the warm blue ocean and the nearby tiny islands that made you dream of a different life. This is arguably one of the most peaceful places in the financial hub of Asia. A 360 degree view of the hills, oceans and the islands- oh, how I missed my DSLR at this point. After a while, I returned to the trail and was greeted by another tiny beach with warm blue-green water. The beauty of this place lies in its simplicity, there is nothing to do except sit and relax. Right there, I experienced “The joy of doing nothing”. The rest of the trail is a normal path where I met a few friendly locals who marvelled at my courage for travelling alone. The other side of this island has a nice waterfront area where one can fish or jog or simply sit and read a book. A few tiny and yet beautiful Chinese temples also adorn this island. I parked myself by the water as the sun slowly descended behind the mighty mountains and allowed my mind to get lost in the pages of “Old Man and the Sea” by Ernest Hemingway. After an hour, as I took the ferry back to the city, I could not help but feel a sense of pure joy and happiness as I felt my life was just as good as it can get. Pro tip: Visit on a Saturday or a weekday instead of a Sunday to enjoy cheaper fares. Don’t forget to check the timing of the last ferry back. Giant’s causeway in Ireland is probably on every traveller’s bucket list but I was surprised to see how little people know about the UNESCO Geopark in HK which boasts of unique hexagonal columns and rock structures that are a geographic miracle. 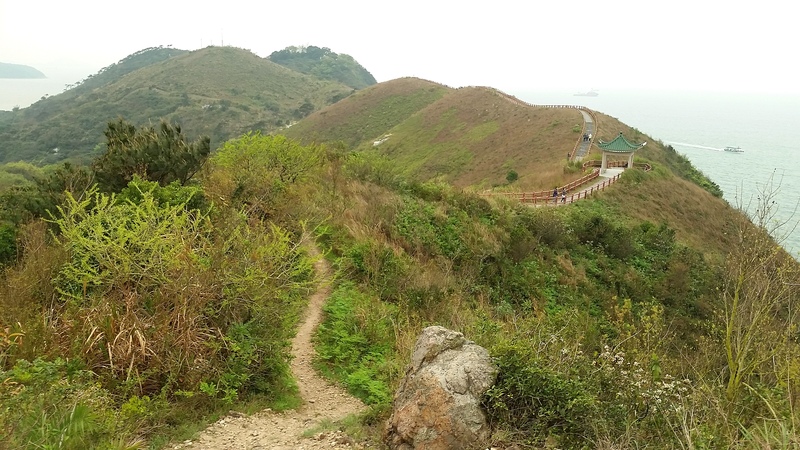 Thus, on one find morning, a group of three expats took the bus to Sai Kung and arrived at the Volcano Discovery centre which is right beside the bus terminal. We quickly booked the “East Dam Half-day tour” for 2.30 pm for 90 HKD per person before exploring the Sai Kung town. Situated far from the skyscrapers, this area had an extremely happy vibe with a slight European touch. The tour is basically just two-way transport in a mini bus with a rather annoying guide speaking in cantonese during the entire journey. It lands you in the East Dam reservoir which was created right in the middle of the sea. As you walk down this geographically diverse land, unique rock structures greet you along the way. The water was a shade of warm blue despite cloudy weather and the path leads to a tunnel like structure which has been naturally created. 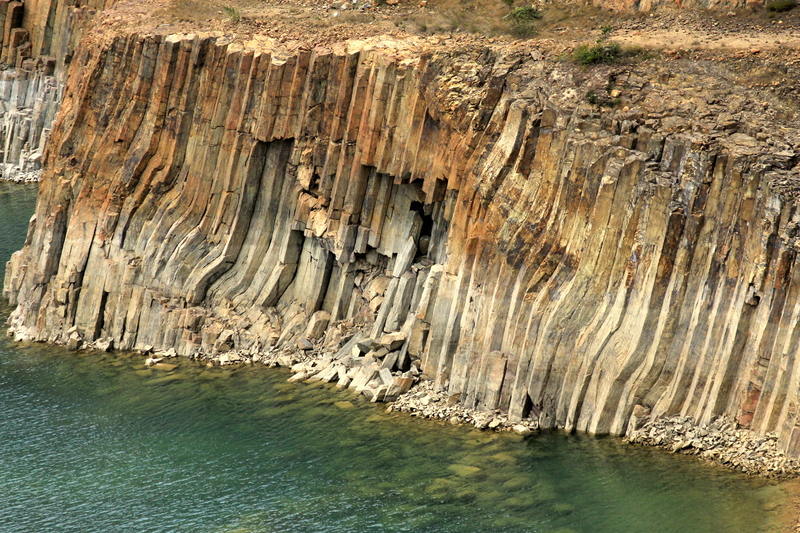 Some of the Hexagonal columns which truly resemble Giant’s causeway are on the other side of the reservoir and pretty much covered by big rocks. Although, you can get a peek at them, it’s not the best angle. There are several hiking trails which provide much better views but without hiking, this was a truly incredible sight. 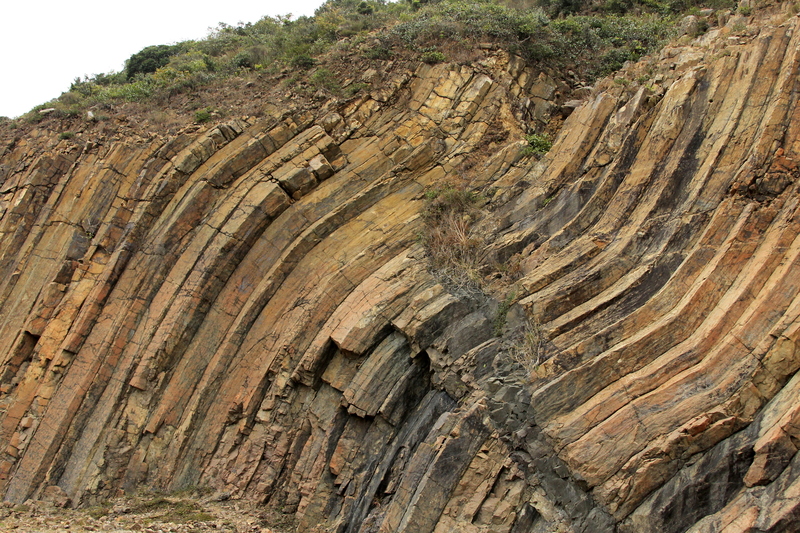 However, this trail itself provides direct view to a whole new sets of fascinating rock structures which are bent in distinct manners due to volcanic eruptions. 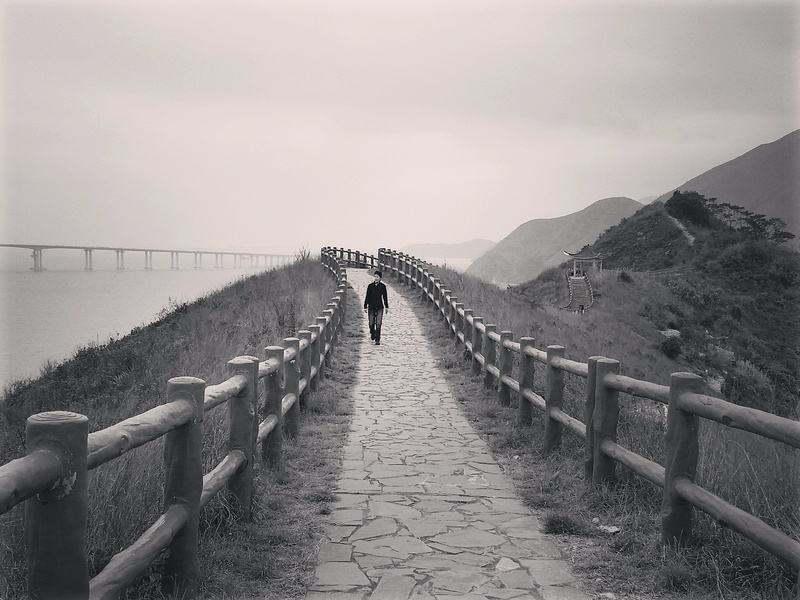 Before walking down the slope, another path diverges to the left. During our day trip, we had followed this trail after returning from the dam and we encountered a never-ending flight of stairs. We kept hoping for a stunning view and at some point, I saw a tiny gap amongst the trees. I walked through and was greeted with a serene landscape. On one hand, layers of vertical rocks and almost turquoise water and on the other, uncountable number of hills fading into infinity. And just like that, we found our place. We spent the next 10 minutes quietly sitting and inserting every inch of this view into our memory before we headed back to try a delicious Sri Lankan meal in Sai Kung town. Pro tip: Make sure you go there on weekends only. Take bus 92 from Diamond hill and get down at Sai Kung bus terminus. The volcano discovery centre is right beside the terminal. 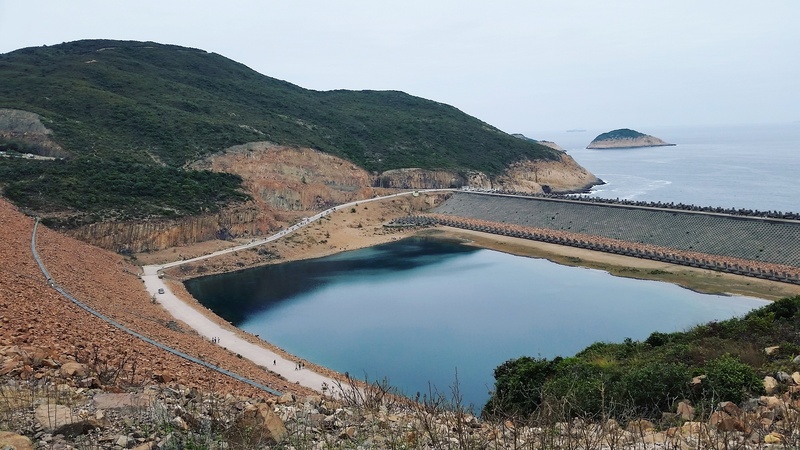 Pay 90 HKD and book the East Dam half day tour for either 11am or 2 pm. Carry enough water and food. Hong Kong does not only boast of spectacular views from the hills but also of gardens and temples which showcase its rich history. 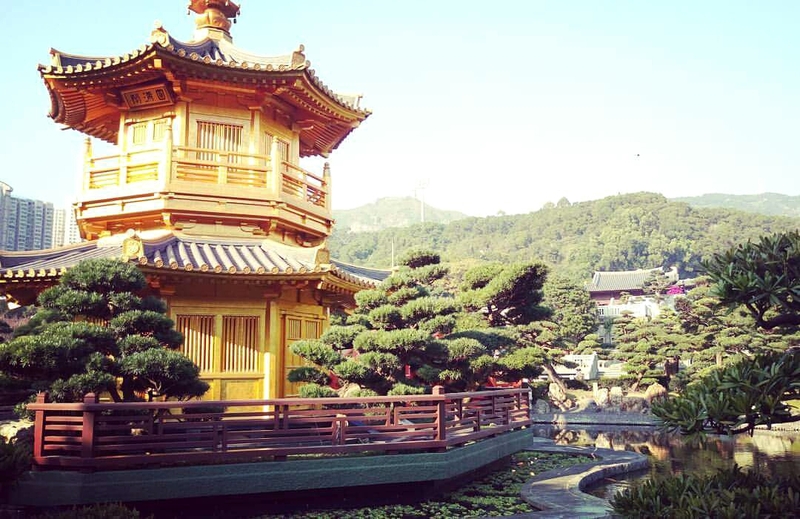 Just a 2-minute walk from Diamond Hill station is the Nan Lian Garden and Chi Lin Nunnery which will remind you of a mini-Japan. As the Golden temple situated amidst a small and calm lake dutifully reflects the rays of the sun, one can’t help but wonder how such a serene place exists right in the middle of the city. The skyscrapers of Hong Kong at the background provide a stark contrast almost as if to remind you of where you are. 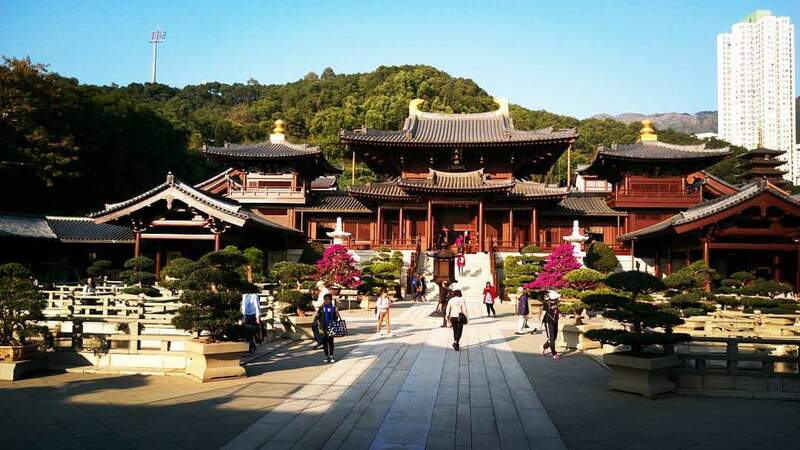 The Chi Lin Nunnery is connected to the Nan Lian Garden (both of which have free entry) and although you can’t really expect to find actual Nuns here, the architecture will surely compel you to take out your camera. The best time to visit is around 3.30pm-4pm when the sun is still up and dutifully brightens the nunnery and the garden. The various galleries throw light on the history of Hong Kong and remind you that Hong Kong is much more than a stunning skyline. Pro tip: Go here on a sunny day to enjoy the reflections of sunrays! Make sure you visit the Nunnery before 4.30pm as they close early some days. Before the tall glass buildings rose up in front of the picturesque hills, Hong Kong much like Singapore was a fishing village. 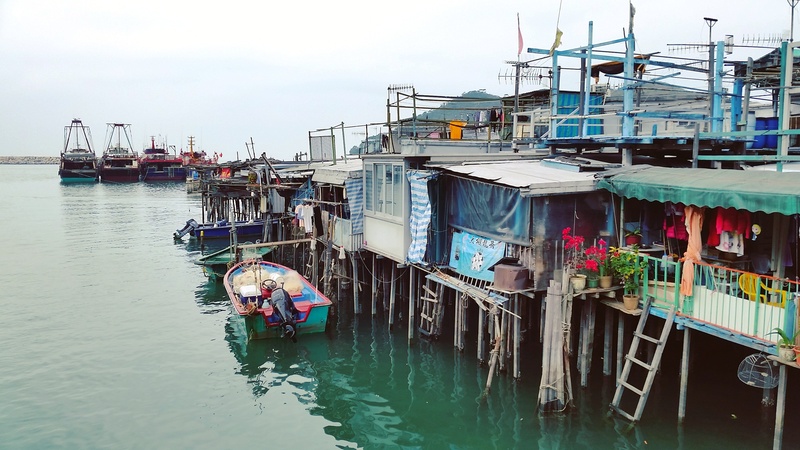 Tai O is the perfect place to rewind time and return to the roots of this glamourous city. Fishermen selling fresh fish from the boats, crowded markets providing a taste of authentic Chinese cuisines and wonderful look-out points without hiking- that’s what Tai-O is all about. As you hop off the boat in Tai-O, you will be greeted with traditional stilt houses which had withstood the test of time. Walk past the lady who will be selling boat rides for tourists around the village and squeeze yourself out of the marketplace. Following the signs of the Dolphin Watching point/ To Fu Shan viewing point, to reach the starting point of a flight of stairs. 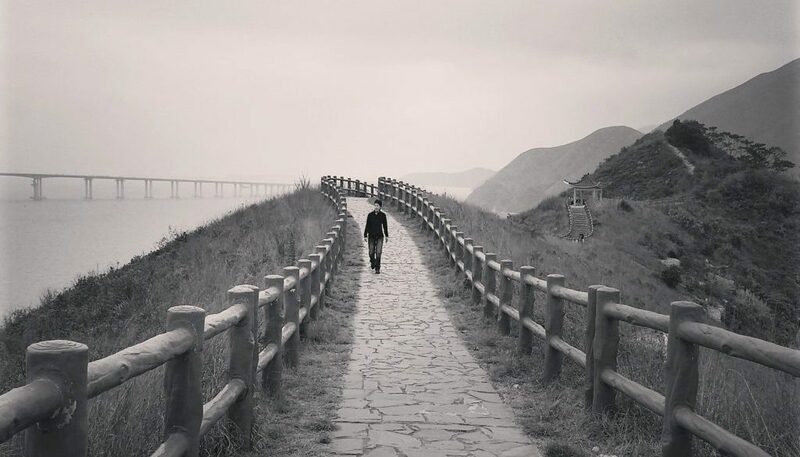 Walk past the shaolin kung fu centre and walk up the stairs to reach the viewing point. After nearly 15-20 minutes of slow staircase climbing, you reach the view point which is rather a path by itself more than a point. 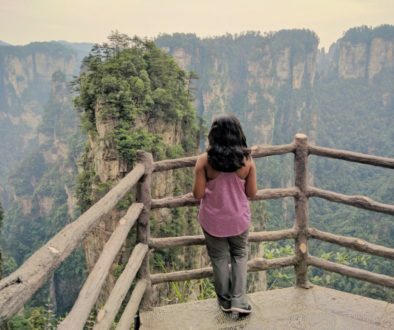 As you let your feet guide you along this lovely path, your eyes will meet a bridge disappearing into infinity amidst the never-ending ocean on one side and uncountable breath-taking hills on the other side. 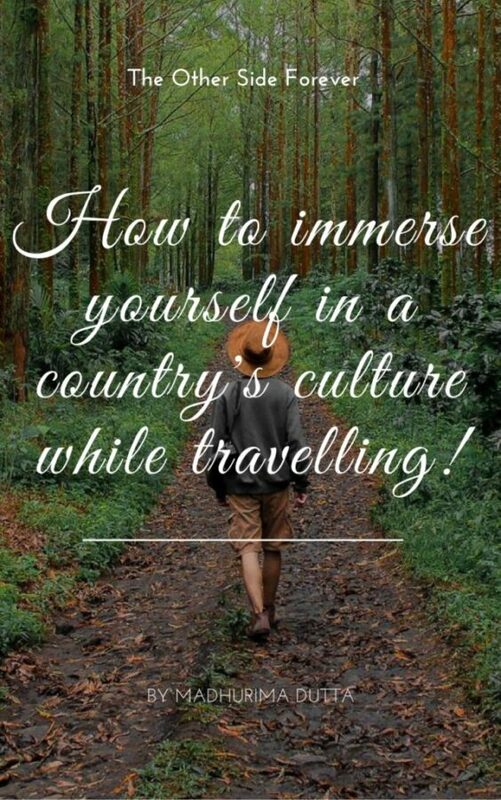 I distinctly remember the feeling of the fresh wind finding its way through the curls of my hair and at that moment, I suddenly experienced what Singapore could never provide me- a sense of absolute freedom! Pro tip: Make sure you walk up the small hill beyond the resting area to get the best view. Take the boat ride around the stilt houses if you have time. 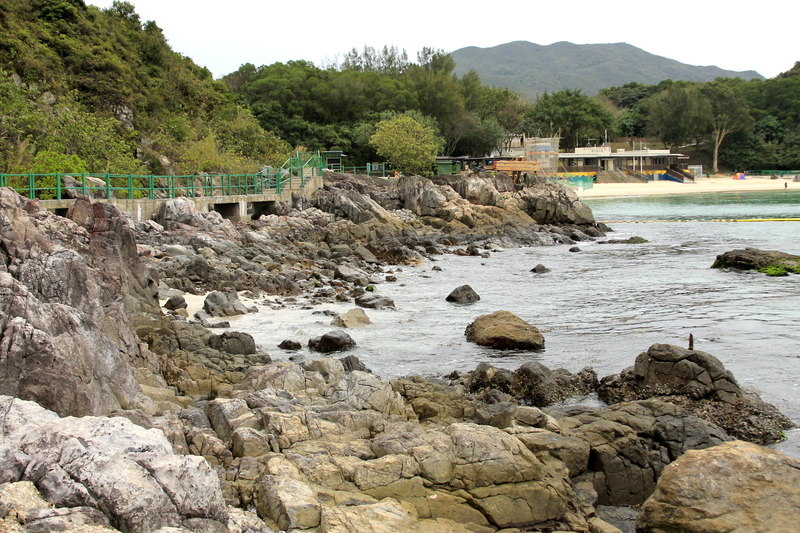 Sai Kung is filled with hidden treasures waiting to be explored. 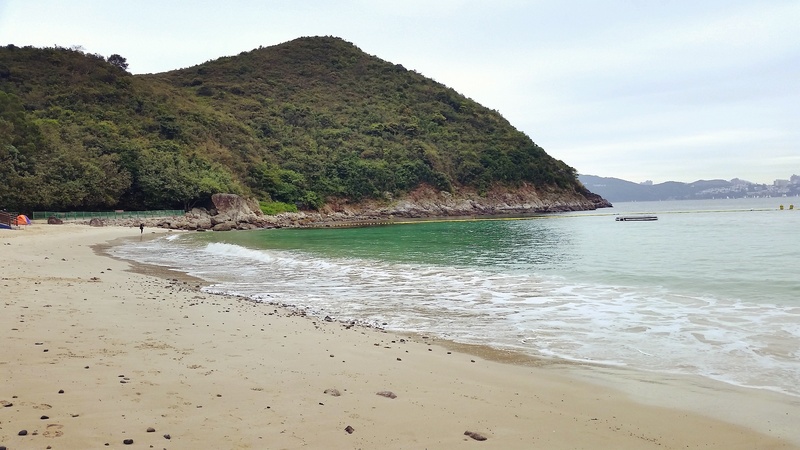 While most of Hong Kong’s beaches tend to get quite crowded over the weekends, Hap Bun Bay beach remains pretty isolated. 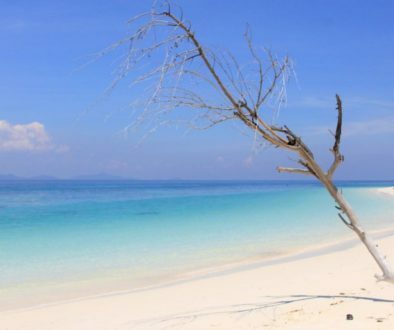 While most people visit Sharp island, this beauty lies unexplored even by most locals. The best part is that it is extremely accessible. One boat ride from Sai Kung public ferry drops you right at this island. The boat ride will cost about 30-50 HKD for two-way transport. With mountains on both sides of the sea and tiny islands scattered all over, the journey itself will freshen up your mood. As the ferry drops you off on this deserted island, without a single soul nearby, one can’t help but feel like Robinson Crusoe. My first impression of this island is a piece of land filled with rocks in all shapes and sizes. As we ventured further into the island, we reached the beach which was absolutely empty except for a nearby tent. While the beach wasn’t exactly like Indonesia’s soft white sand beaches, it was definitely one of the best Hong Kong could offer! With a population over 7 million cramped into a few small islands, it is a well-known fact that Hong Kong is grossly overcrowded. The clear green waters of Hap Mun Bay is the ideal escape from the crowd. A day trip here or an overnight camping trip will give you the much needed respite your soul desires. Pro tip: A perfect spot for camping. There is even a barbeque pit and showers nearby. Speak to any of the ferry operators to reach this island. The ferry will usually drop you off and pick you up when you call them up but make sure you call in advance. Carry your food with you. Hong Kong wasn’t always a glamorous modern city and the proof of that lies in Kowloon Walled City Park. Kowloon walled city was a den of illegal activities including drug peddling and prostitution accompanied by terrible standard of living. After years of attempt, the government finally succeeded in revamping the entire area. 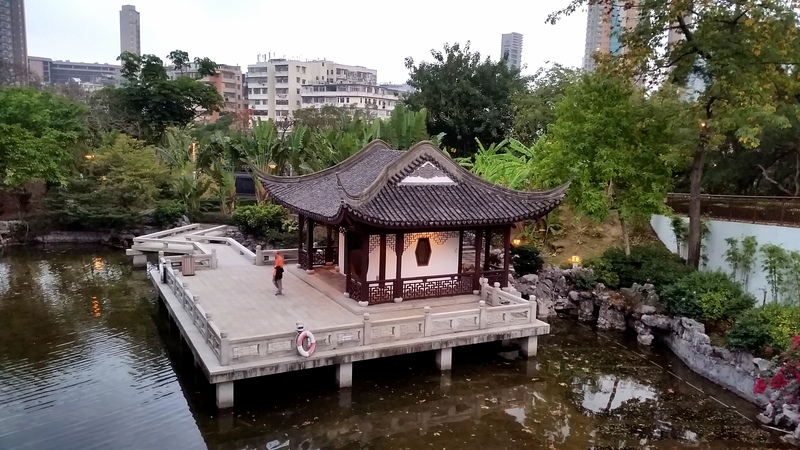 To preserve this epic heritage, the Kowloon walled city park was built which is not only filled with beautiful gardens but also a timeline of Kowloon walled city itself. A rare gem in Hong Kong which often goes unnoticed. Pro tip: Visit before sunset! Hong Kong is not only home to stunning landscapes and skyscrapers but also boasts unique street art all over the city. 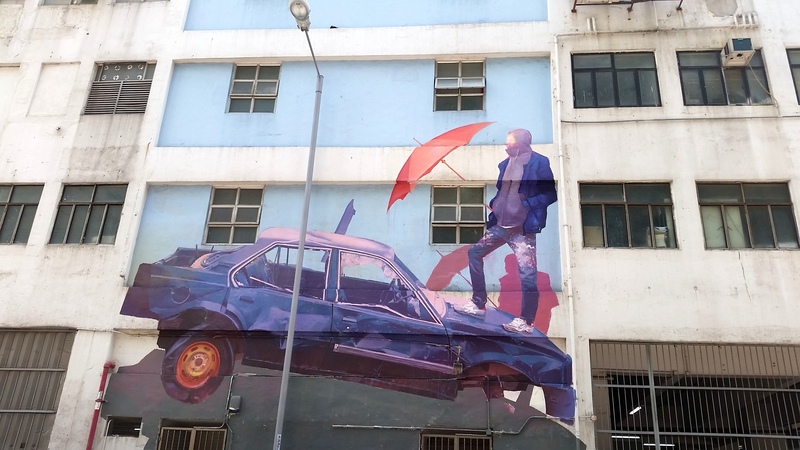 An event called HK Walls have been making the city’s street art scenario even more lively. 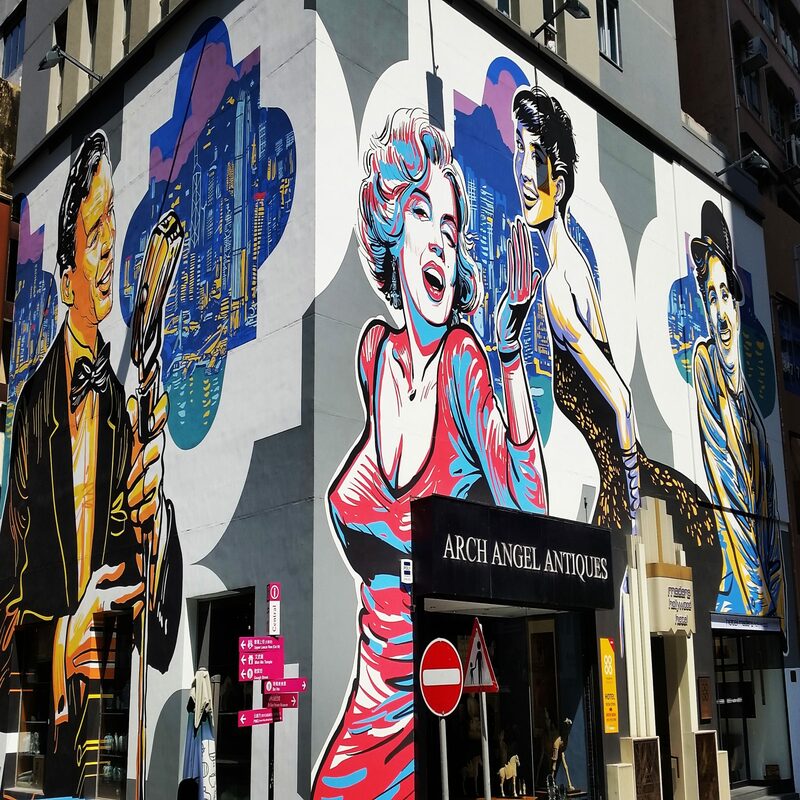 Other than the famous murals at Central and Sheung Wan, Wong Chuk Hang and Kwun Tong is home to some of the coolest street art painted by domestic as well as international artists. 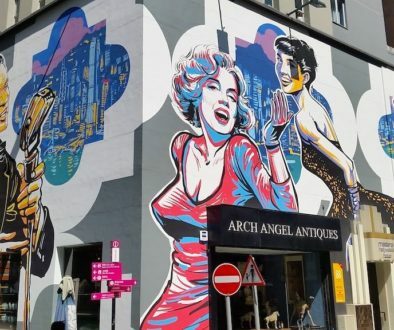 Head over to Ovolo southside Hotel to find some colourful murals. 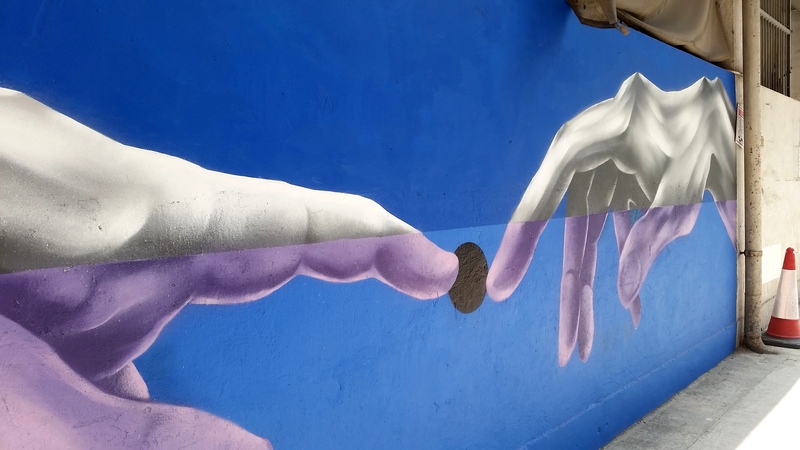 Download a map of the latest murals from the website of HK Walls to make sure you don’t miss any of them. Pro tip: Don’t miss the event HK walls if you are in town during March! More information on HK Walls can be found here: http://hkwalls.org/ and don’t forget to read my guide on Hong Kong’s coolest street art! Hong Kongers work hard during the week, escape to nature during the weekend and eat wonderful food all week long. As my stay in Hong Kong is came to an end, I almost felt a sense of nostalgia. I wish I had a little longer perhaps- to explore this unique country and spend time with wonderful people from all over the world. Somewhere in the middle of adjusting to a new lifestyle and going through meltdowns, I found the soul of Hong Kong and fell in love with it. Follow me on Instagram @madhurimadutta12 for more awesome pictures and don’t forget to subscribe to my blog for updates on unique content from around the world! Wow who knew that Hong Kong had so much to offer? I went there for a day and was quite satisfied with seeing the markets, the sound and light show and going up the long escalator. Now I feel like revisiting Hong Kong. Hey this is awesome 🙂 Number 2 and 5 look absolutely stunning and I like Tai O as well, reminds me of the beautiful clan jetties in Penang. Thank you for sharing! Keep up the good work! Hi Indra, Thank you. Yes, I lived there for 3 months, not enough time to see and understand all but definitely observed some interesting things 🙂 Hope you liked it. Great finds! Lots of good suggestions. I have been to Chi Lin and Kowloon City Wall Park – definitely a good break from the traditional skyscrapers. Thanks Charmaine. Agreed. For a city filled with skyscrapers, these places are wonderful breaks within the city itself!